Background: Acute Systemic Diseases (ASD) impact on extended leukoaraiosis (ExLA) have been seldom described. We study the deterioration in daily life activities (DLA) and cognition associated with ASD events compared with the well-described impacts of stroke in patients with leukoaraiosis (L-A). Methods: Cross-sectional surveys of aged adults from the emergency room after an acute event of ASD or stroke, hospitalized or receiving home care, were followed for one year. From 268 initial patients 206 were included in the study, all with moderate to severe L-A (Fazekas 2 and 3). The Clinical Deterioration Rating (CDR) and the modified Rankin scale with structured interview were obtained one week previous to admission and after 3 and 12 months of evolution. Comparisons were conducted within and between groups with nonparametric techniques. Results: We formed three groups of similar age, A: Inpatients with one Stroke, B: Inpatients with one ASD, and C: Outpatients with one ASD. A sudden deterioration in Rankin was evident in Group A, while in B and C impairment was progressive. 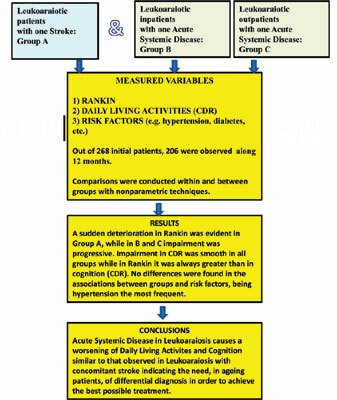 Impairment in CDR was smooth in all groups while in Rankin it was always greater than in cognition (CDR). No differences were found in the associations between groups and risk factors, hypertension being the most frequent one. Conclusion: ASD in ExL-A causes a worsening of DLA and cognition similar to that observed in ExL-A with concomitant stroke indicating the need, in ageing patients, of differential diagnosis in order to achieve the best possible treatment. Abstract:Background: Acute Systemic Diseases (ASD) impact on extended leukoaraiosis (ExLA) have been seldom described. We study the deterioration in daily life activities (DLA) and cognition associated with ASD events compared with the well-described impacts of stroke in patients with leukoaraiosis (L-A).